It won’t be long before more people have them than don’t. Today, though, we’re talking about dog and cat tattoos. These tattoos are not for decoration, but for conveying information. Discreet, painless tattoos are performed while the patient is still under anesthesia. Veterinarians use small, straight-line tattoos when pets are spayed or neutered to let future caregivers know that this particular pet no longer has internal reproductive organs. Suppose circumstances, economic, medical or catastrophic made it necessary that your pet go to live with someone else. You may or may not be able to convey to the new owner whether your pet had been surgically altered. Suppose, now, that the new owner observes problems with the pet and his new veterinarian suspects that those problems may be related to the reproductive tract. Do you want your pet to have to undergo a surgical exploration of the abdomen for organs that aren’t there? A little tattoo, a couple of millimeters wide and a couple of centimeters long answers that question as soon as it is asked. Another example of a spay tattoo. Notice that the surgical incision barely left a scar. Some surgical incisions heal so well that no evidence is left behind that entry was ever made. Even if there is a scar, it only tells us that there was interruption of the skin there. Is the scar from an injury? Is the scar from a Caesarean section? Is the scar from bladder surgery? There are only three ways to know: surgical exploration (painful and invasive), hormone assays (expensive) and tattoo (free and performed after surgical alteration while the patient is still under general anesthesia). Which do you want for your pet? While it might seem that it would be obvious in the case of male dogs and cats, a condition called cryptorchidism demonstrates the necessity of a tattoo for them, too. Cryptorchidism occurs when testicles fail to enter the scrotum and instead are retained in the abdomen. If neither the left nor the right testicle leaves the abdomen a scrotum will never be formed and a veterinarian is left to wonder whether the pet was neutered very early in life or has testicles in the abdomen. Retained testicles are predisposed to two types of cancer and a condition called torsion of the testicle. Torsion results in a painful, potentially life-threatening condition that requires immediate emergency surgery. A male pet presented for abdominal pain, with no testicles in the scrotum and no surgical tattoo may undergo unnecessary abdominal surgery looking for a torsed or cancerous testicle that isn’t even there. So, when your pet’s doctor recommends a small, discreet surgical tattoo with your pet’s alteration surgery, don’t hesitate to say yes, although, like everything about your pet’s medical care, the decision is up to you. Tattoos are optional. I adopted a male kitty with a green line tattoo on his abdomen, a little more than half an inch long. I read through his medical records and found out he was tattooed at the Maui animal shelter after being neutered. My previous cats were never tattooed, and with all the fur they grew it would have been hard to tell if they were spayed or neutered. I think it’s a great idea! If I hadn’t been rubbing his belly, I wouldn’t have seen the tattoo, so I don’t know why people are so upset about their animals getting a tattoo. I had a tattoo placed on my neck when I had radiation therapy, I wasn’t asked about it, they just tatted two dots where the beams were to be focused. Unfortunately I can’t grow fur to hide my tats, but since no one sees them unless I point them out, it’s kind of hard to go around complaining about them. Thanks, Michelle. Click here for more information about spay/neuter tattoos. Thanks for reading http://www.MyPetsDoctor.com. I am wanting to speak at a commissioner meeting this week asking them to encourage our local animal control to tattoo spayed dogs so save them from unnecessary surgery and in doing so, saving the county money. Is there a reason some vets do not tattoo? are they all capable of doing it? It’s a good question. I don’t know why it isn’t always done. It’s simple enough, and the only “special equipment” you need is tattoo ink. You should still have the right to not get a tattoo. All of my dogs have impeccable records kept both online and original paper form. Wife and parents know this and even if I died the dog would stay in the family. While its not a huge deal I think you should have a choice as I recently found the local vets demanded it be done so I had to drive 3hrs to a previous vet to have it done without. Like everything about your pet’s medical care, the decision on tattoos is up to you. Agree with Giovanni 100%. We were not even told it was going to happen. Appalling and senseless because we were taking her to be neutered not tattooed. We have no need for a tattoo because the odds are overwhelming that this family will look after the dog through her entire life. A black crossed out female sign is revolting imagery. Who even thought of that symbol? Not to mention it was probably very painful. Can it be removed? Can it be removed? Of course, but it would require a surgical excision. “A black crossed out female sign?” Odd, since the standard is one or two short, straight lines. No pain involved, as the tattoo was performed while still under anesthesia. No one has a crystal ball, and no one knows when one’s pet will get away from us, or we die in a calamity the pet survives, then who is left to know the pet has been spayed? Our surgical permission form includes a line for the pet owner to have the option to decline the tattoo, but we’ve never had anyone elect not to have the tattoo. I just adopted a spay and she underwent unnecessary surgery and was already spayed. When I worked at the Humane Society, this happened all of the time. Even though you have impeccable records, you can’t guarantee that your dog will never go missing. The unexpected happens. I found my cat on the side of a building in San Diego about three years ago. She was sick, and had a scar showing that she had been spayed in the past few months. I noticed that she had a pink heart tattoo a few inches away from her scar, but when I took her into the vet they didn’t know what it was, and they scanned her for a microchip but couldn’t find one. Someone else told me they got their cat from the Humane Society and it had a similar heart tattoo, but I could never find any information about it. Any thoughts? Sorry, none. I Googled “pet heart tattoo,” but all I got was images of people with heart-shaped tattoos. It’s a new one on me. Thanks for reading MyPetsDoctor.com. A friend of mine found a female dog that has been spayed. She does have a marking/tattoo where the incision had been made. Can we find out which doctor did the surgery by their markings? Please help me so I can help her to get back home to her family. Spay/neuter tattoos are simply straight lines. They are usually black or green. Around here, I know of only a couple of practices where green ink is used, so that makes identification pretty easy, but, beyond that, it’s a guessing game. If your city is not too large you could take the dog from clinic to clinic showing them the dog and tattoo and see if they recognize her or the tattoo. Any clinic can also scan her for a microchip. 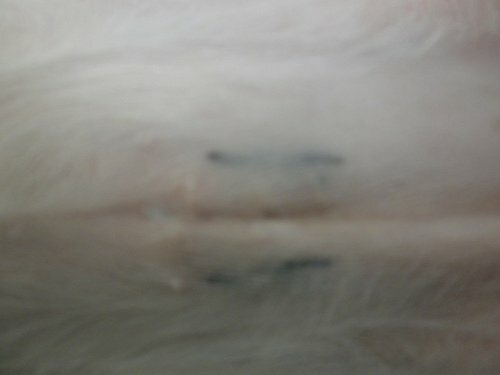 I was just looking at my dog’s spay scar, and wondered what the green part was – nobody at the clinic told me! Me and her “dad” both have tattoos, how cute that we’re all tatted up! Thanks for your post Dr. Randolph, now I know! Is it possible for a male dog to be Neutered and still have his testicles? My wife brought a very small dog(9.5 lbs & 1-1/2 years old). I was told he was neutered. He’s very hairy & I am unable to find his tattoo. If he had a tattoo I believe it would be very small. Any ideas? First question, can you see testicles? If yes, he hasn’t been neutered. Which doesn’t mean he didn’t have a vasectomy, which would render him sterile, but which doesn’t protect his prostate gland from constant bombardment of the hormone testosterone. However, vasectomy is rarely performed in veterinary medicine. Second, if he is cryptorchid, you wouldn’t SEE the testicles if both are in the abdomen, but he is unlikely to be sterile and his testicles would still produce testosterone. Cryptorchidism can be unilateral (1 testicle visible, the other hidden) or bilateral (both testicles hidden). I’m curious about his doctor-care status. Did you ask his veterinarian these questions? If, on the other hand, you haven’t yet taken him to a doctor, that should be done right away so that he can have a thorough examination, proper vaccinations, heartworm preventive and testing for intestinal parasites. I have a question about the types of tattooing that are available for pets that are spayed or neutered. I am a clinic supervisior of a low cost spay/neuter, Wellness clinic that is about to open and I am researching different ways to do this. Is there a link somewhere to help me out? I adopted an older cat who the previous owner told me is fixed, but she doesn’t have the tattoo. Is there anyway to ensure she is fixed and get the tattoo for her? Hello, My rescue dog has a green blob of tattoo ink on his abdomen, really close to his inner leg. There are no numbers, lines, or symbols. It looks more like the tattoo needle was placed randomly all over a 1/2″^2 area. He was neutered while in the shelter, and they claim he came in with the tattoo. Any idea what it is for? Lydia, I can only venture a couple of guesses: 1, maybe the previous owner tried an amateur tattoo. 2, it could be a birth defect of some type. Strange, isn’t it? My dog has the same green dot but smaller. It’s like someone took a pencil eraser, dipped it in paint and put it in the same spot you dog’s is. No idea why..
Shelters in the US give dogs small green DOTS; not lines. I have adopted a few pets and (especially the males) have a green or bluish ink blot on the side of the abdomen (near the spot where a female pet would have her incision for an altering surgery. I’m sorry to have to disagree, but there is no standard for spay/neuter tattooing, so veterinarians are free to make dots, lines, circles, whatever indicates that the patient has had gonad-removal surgery to prevent him from having unnecessary surgery. Nor is there a standard on color, so green and black are commonly used, but other colors are equally acceptable. Thank you for reading our blog, Best Wishes, Dr. Randolph. Why tattoo a male dog. It’s clearly neutered if it doesn’t have testicles. I think it’s unnecessary and cruel. Think about it. Think about it? I already did. That’s why, long before you wrote, the answer to your question is right in the article. If a male pet is cryptorchid, no testicles will be visible from the exterior, and one could easily think the pet was neutered, when he wasn’t, and might have dangerous tumors growing in his abdomen. As for “cruel,” modern pain management techniques handle all of the pain our surgery patients experience, and the intradermal injection of ink not only occurs while the patient is still under anesthesia, it is no more uncomfortable than any other injection. Thanks for reading http://www.MyPetsDoctor.com. One of my dogs was in a county animal shelter before he was fostered out and I adopted him. The shelter neutered him and tattooed him with a blue circle with a line through it. I wondered about the necessity of tattooing a male. Thanks for the information. Feel free to write back if you have any more questions, Dr. Randolph. Dr. Randolph, many local veterinarians in the Birmngham, AL, area are familiar with the spay tattoo line marking, but some have said they do not know how it’s done. Is there a reference point you can recommend that I pass along to these veterinarians? I’m involved with Boston Terrier Rescue of Alabama, Inc. and we would like to have all of the females we spay marked to avoid future unnecessary surgical procedures just to check should one of these dogs end up lost again. We are microchipping, but would like the spay tattoo as well. One Dr. asked me if it is beneath, beside, or “on” the spay line… Can you please offer some advice? Thanks so much! Evelyn, send me as many veterinarians as you like and I will be more than happy to explain to them, in writing, how to perform the tattoos. There are a couple of techniques that I know of and I’d be glad to share. Thank you and all of the rescuers who are doing such wonderful work, Dr. Randolph. A dog recently wandered onto my property. She appears well cared for and is obedient. I noticed a tattoo on her abdomen in the area where spaying surgery would occur. It is a green line approximately 1/2 inch long and maybe 1/8 inch wide. I talked with several veterinarians in my community (Carrollton Georgia – 30 minutes west of Atlanta) and they are not familiar with tattooing an animal after spay/neuter. 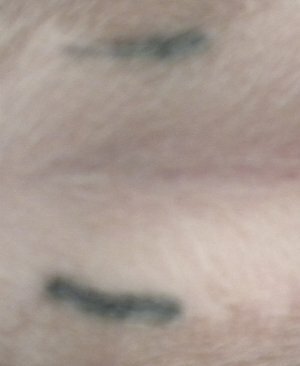 Can these tattoos be used to identify an animal in any way? Do you know which states use this tattooing? Any information you can give me would be appreciated. Thank you…. Interesting post, Sherry. I’m really surprised that you were able to find more than one doctor in your area who wasn’t familiar with tattooing spayed and neutered pets. I was also interested to see that you mentioned the tattoo was a single green line, which is the style the Humane Society of South Mississippi uses. Their Web site is HSSM.org. Did you ask one of the doctors’ offices to scan the pet for a microchip? It may well have been chipped when it was spayed. Please keep us notified, as we would like to help you get this baby back home where she belongs. Thank you for caring, Dr. Randolph. I’ve seen parallel lines on either side of the incision, single lines ahead of or behind the incision, but never a “V.” However, there is no medical standard for these tattoos, and I suppose a doctor must have had a reason for choosing that design. What does your local veterinarian say about it? Best wishes, Dr. Randolph.